I had a great time with today’s theme: Tangleations! What is a Tangleation you ask? It’s where you take already learned tangles and combine them to make a new tangle variation. It’s like a music mash-up without a melody. 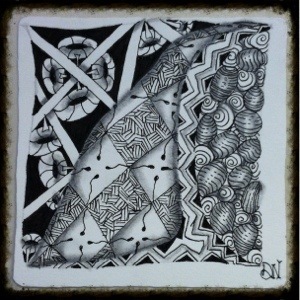 At first, I thought this challenge would be hard- deciding which tangles to combine, how I would combine them, etc. However, once I started creating one, more followed quickly. Before I knew it, I had 6 new Tangleations under my belt! Here is the list of tangles I used to create each new Tangleation: Fescu, Knightsbridge, Nekton, Crescent Moon, Static, Hollibaugh, Pokeroot, Festune, Scoodle, and Isochor. Can you guess which ones I combined together in the tile above? As always I hope you “like” this post! i LOVE the new look!!! it’s a KEEPER!!! Scoodle, Knightsbridge, Nekton, Hollibaugh, Isochor, and Fescu. Am I right? Another great piece! Love ya!! !